Seven Corboy & Demetrio partners have been selected for the 2019 edition of The Best Lawyers in America in the practice areas of Personal Injury Litigation – Plaintiffs, Medical Malpractice Law – Plaintiffs, and Commercial Litigation. Thomas A. Demetrio, the firm’s Co-founder, was selected in the categories of Medical Malpractice Law–Plaintiffs and Personal Injury Litigation–Plaintiffs. Thomas has earned a spot on both lists for 32 years. 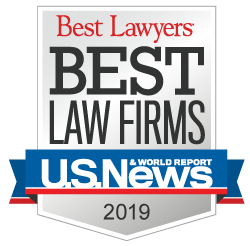 “The selection of seven of our partners, by their peers, to Best Lawyers in America is a testament to how well our partners are regarded in the legal community,” Demetrio said. Best Lawyers lists are compiled based on an exhaustive peer-review evaluation. Lawyers are not required or allowed to pay a fee to be listed; therefore, inclusion in Best Lawyers is considered a singular honor. Partner Philip Corboy, Jr. was selected for the 14th year in the area of Personal Injury Litigation–Plaintiffs. Managing Partner Robert J. Bingle was selected for the 5th year in the areas of Personal Injury Litigation–Plaintiffs and Commercial Litigation. Partner Michael K. Demetrio was selected for the 12th year in the area of Personal Injury Litigation-Plaintiffs. Partner David “Chip” R. Barry, Jr. was selected in the area of Medical Malpractice–Plaintiffs for the 8th year. Chip was selected as Chicago Medical Malpractice Lawyer of the Year by Best Lawyers in 2014, an honor also achieved by Thomas Demetrio in 2011. Before joining Corboy & Demetrio, Chip worked as a medical malpractice attorney for the defense and was recognized by Best Lawyers for several years. Joining the list for the first time are Partners Kenneth T. Lumb in the area of Medical Malpractice-Plaintiffs and Daniel S. Kirschner in the area of Personal Injury Litigation – Plaintiffs.